Kayakers spend the day exploring the wilderness of Kejimkujik National Park in Nova Scotia, Canada traveling along the Mersey River. Lush greenery blankets both sides of the Mersey River where various species of wildlife such as deer, moose, black bears, bobcats and foxes roam free. Kayakers can stop along the river at secluded areas which are unreachable by people on foot and enjoy a picnic lunch. Kejimkujik National Park covers 381 square kilometers with easy access to the Mersey River which is why so many kayakers come here during the summer. 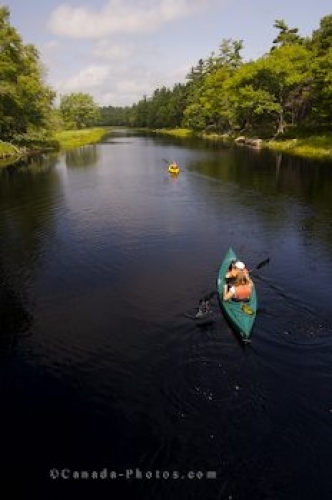 Picture of kayakers along the Mersey River in Kejimkujik National Park in Nova Scotia.